Aesop's had me at "to combat the malodorous." haha I'm so sorry you had such a bad experience getting your bathroom renovation done. That kind of thing is stressful enough when it's running smoothly, but when you have to deal with problems, you feel like your head is going to explode. I'm beginning to feel that way with my contractor. After moving in and loving my little house, leaks developed in the bedroom and bathroom ceilings. He came and out repaired the leaks, but he's taking forever getting the ceilings patched and retextured. Grrrrrrrrrrr....I'm getting very unhappy. I can't wait to see the reveal photos. I know they will be lovely. *Love* those subway tiles - gorgeous. And... Aesop. I can't decide between 'genius' or 'WTF!!'. Maybe that means it's a perfect product. Or maybe not. I wonder if they do samples. I wonder if I have the nerve to ask. Oh Kylie, I feel your pain. But, thanks for keeping it real. I like your new window, how interesting that you live in an old corner shop. I didn't realise, I probably have not been following your blog for long enough! I often gaze at the interesting old, empty shop fronts around Broken Hill and think they would make charming homes. Perhaps not always particularly practical though? The Aesop product is funny isn't it. I like their products but haven't ventured into this territory before. Self closing lids...I have never heard of them. Have I been living under a rock I wonder?! I'm sorry for your pain but you have really hit the nail on the head with the poo dinner plate dilemma that I am experiencing at the new surgery. We have recently bought and renovated new premises and the new toilet is driving me mad! I am constantly cleaning large deposited cruddy bits off the bowl. AND I totally agree with the self closing lid thing too. I await your next post Miss. Keep it real, Kylie, always keep it real! Oh lord, what a time you have had of it with your bathroom, but it's done (mostly) and the window looks great, and I am looking forward to the big reveal. 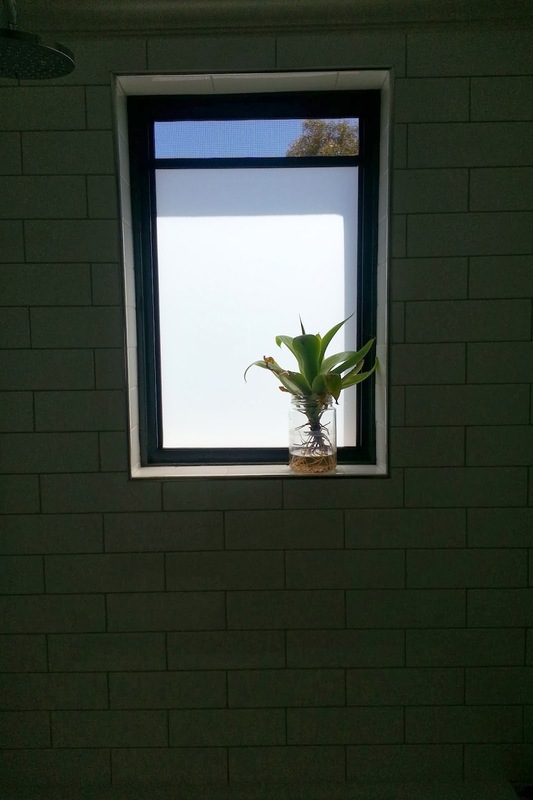 The bathroom window looks grand. So disappointing about shoddy workmanship. Who do some people think they are? Yes, $29 may seem like a hefty price to pay for a toilet deodoriser, but heck Post-poo drops is good stuff and I swear by it. Only need a couple of drops, so it lasts an age. It's also worth every cent when one has would-be arsonists in the house. Thank goodness it is all finally over with. It looks amazing. I hope it's not too bittersweet and that you really enjoy your new space now. Do you watch The Block? I seriously do not know how they do it. Obviously The Block tradies are some import from planet tradie cos I don't think the real ones ever turn up when they are supposed to, let alone get the job done right! in a week! Such a pain that all did not go to plan with the reno and the tradies left a lot to be desired. I'm so happy for you that it's done. The window looks great! And boy, you are hilarious! I didn't expect so many poo references when I clicked this post, haha!